Today on the blog, I bring you my Pinup Picks for September. I am late in doing this as last month just flew by and I only just realised its October! I know this as there is a distinct chill in the air, my 'big coat' is out, and I am getting increasingly excited about both Halloween and Christmas! So last month, I talked about vintage style Winter boots. I have spent the last 2 years looking for the perfect pair and I thought I had found them in the form of these Victorian style lace up boots. I decided that I couldn't get past the PVC element of those boots. If they were real leather, I think I would have snapped them up sooner, but I just couldn't abide paying nearly £50 for squeaky plastic boots. So I decided to check in with my old friend eBay. My budget for shoes and clothing is minimal, so I often check out eBay for second hand reproduction brands. My search brought up a plethora of old season Irregular Choice, which left me with too much choice if anything! After about a days worth of deliberating, I decided to buy the Irregular Choice Dolly Mixture Boots. They ticked all of the boxes for me - colour, style, heel height, practicality, warmth...(I have a lot of boxes)...and price! These boots cost £49.99 with free P&P. I have taken them for a spin for the first time today and they have not disappointed. 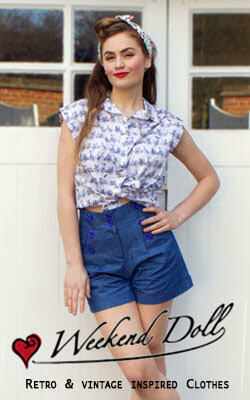 I feel a new collection coming on! Oops! 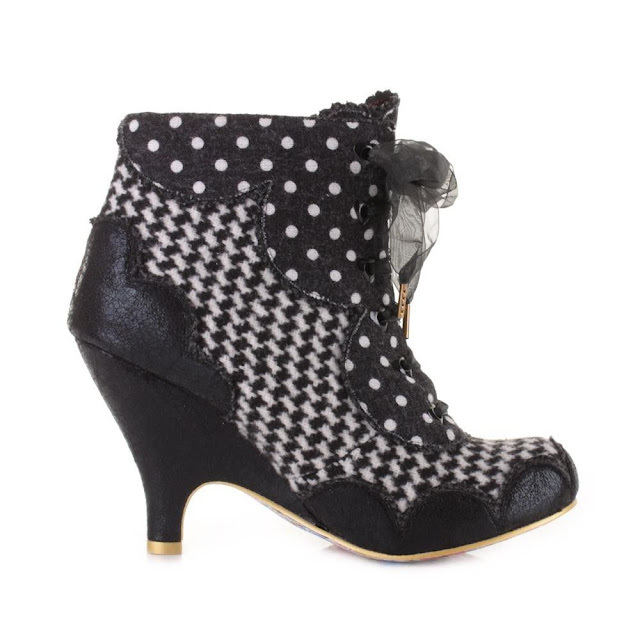 The Irregular Choice Dolly Mixture Boots cost £49.99 and are available from eBay. This dress is just to die for. The colour, the cut, the style, it's all just perfect. Which, to be honest, I would expect for £135. This dress is not in my price range, so again, please feel free to use my blog as a Christmas wish list. Or a 'Happy Wednesday' list, whatevs. 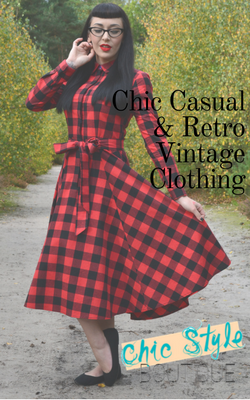 The Fatale Red & Navy Tartan Pencil Dress retails at £135 and is available from The Pretty Dress Company. 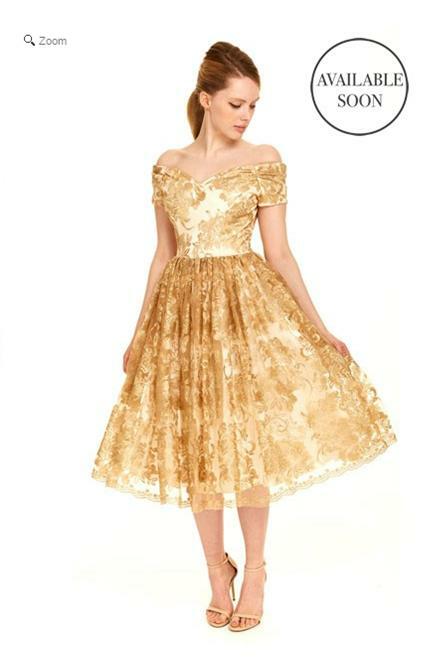 The Fatale Gold Baroque Embroidered Prom Dress...I mean, look at it FFS!! She looks like Belle! This dress, again, is only for those who have money to burn. At £315, it is an investment, statement piece, but wow, it sure would turn heads at the Christmas ball! The Fatale Gold Baroque Embroidered Prom Dress retails at £315 and is available from The Pretty Dress Company. Since my accessory awakening of a couple of weeks ago after I bought my Luxulite earrings, I have been checking out more from reproduction vintage jewellery company Splendette. They have a wonderful range of earrings, bangles, necklaces and brooches in all the colours you can imagine (well, not quite, but you get the idea!) They also have sparkly options, which are great for jazzing up an evening outfit. I particularly like these brown and black Fakelite bangles from their new collection; their Autumnal colours are perfect for the coming season.